An ELITE Tubular Skylight allows you to enjoy free natural sunlight from sunrise to sunset in your home, office, or warehouse. Our tubular skylights are typically installed in bathrooms, hallways, kitchens, offices that are poorly lit and have no windows or access to natural daylight. Our customers are amazed at how sunlight transforms their living and work space. An ELITE Solar Powered Fan will ventilate your attic or garage from sunrise to sunset by circulating outside fresh air to remove excess heat and moisture. Our fans are popular in Arizona, California, and Florida. Customers report both a reduction in the amount of time their air conditioning unit runs to cool their home and more tolerable temperatures in their garage space. Being family owned and operated, at Elite Solar Lighting and Fans we strive to provide our customers with a high-quality product. We utilize top of the line raw materials that are certified annually to meet International Building Code standards, see ICC-ESR1761. Instead of focusing on quantity, we focus on a QUALITY engineered product design that will last over time with minimal to no repairs or replacement needed. With a 25-year product warranty, our dealers and distributors report more confidence in selling and installing our product over other competitor brands. Our commitment to ELITE quality craftsmanship and design is something they can see and touch. Our commercial applications provide a cost effective method of transferring daylight into any commercial building/warehouse. Key benefits include Energy Savings, improving comfort and work performance; are some of the benefits it offers. The most economical and efficient way to add natural daylighting to any dark area of your home. Many key benefits include Energy Savings, Health Benefits, added value and a unique décor to your home. Air circulation in your attic is essential in minimizing the damaging effect that heat and moisture have in your attic. Our Solar Powered Fans provide year round benefits like decreasing your cooling costs as well as maintaining roof structure. With an ELITE Tubular Skylight, sunlight is captured through a clear dome and redirected via reflective tubing to a desired location, delivering brilliant, natural daylight. With an ELITE Attic Fan, sunlight is captured on a solar panel that powers a motor with fan blade, exhausting heat & moisture build-up from enclosed attic spaces. For us, it is QUALITY, rather than quantity, that matters. We strive to honor our name by manufacturing ELITE products built with only the best materials available. Quality materials produce quality products. As fabricators, our focus is to improve performance, efficiency and DURABILITY. We want the quality of our products to show for itself and represent the great company we have built. THEY ARE EASILY INSTALLED ON ALL ROOF TYPES AND DESIGNS. ELITE TUBULAR SKYLIGHT AND ELITE ATTIC FAN OFFERS NATURAL DAYLIGHT AND ENERGY MANAGEMENT FOR ANY TYPE OF SPACE. RECEIVE A FREE SOLAR TUBE INSTALLATION QUOTE IN THE PHOENIX VALLEY! Give us a call today at (480) 635-9748 or fill out our estimate form for a free tubular skylight/solar tube installation quote in Phoenix. Elite solar tubes just don’t change rooms; they transform them. They enhance room appeal, adding light and highlighting color. Jovane Estrada and his assistant recently installed a large solar tube in my master bedroom, which had been light challenged because of a small sliding-glass window above the shower. Now, the room is bright, appears larger and is welcoming. Without adding to heat gain because of triple-pane construction, the solar tube now reveals the varying moods of the Arizona sun, from subdued morning to the clarity of later day. Consider adding a solar LED night light: This provides a delightful glow to the room after the sun sets, providing evening and early-morning functionality without the use of blinding artificial lights. 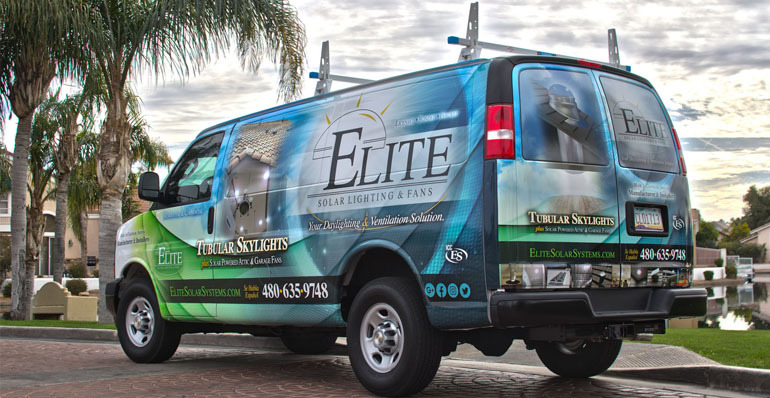 Elite Solar Lighting & Fans is just that, products and service: elite. We purchased a tubular light to brighten up a dark hallway and were very pleased with the results. We also purchased a solar fan for our garage. It has made a very noticeable difference in the temperature of the garage. We like the fact that we are not draining any electricity to run the fan. It is very quiet and can't hear it running. Our sales person/installer was very attentive, friendly and answered all of our questions. We would definitely recommend Elite Solar Lighting and Fans.